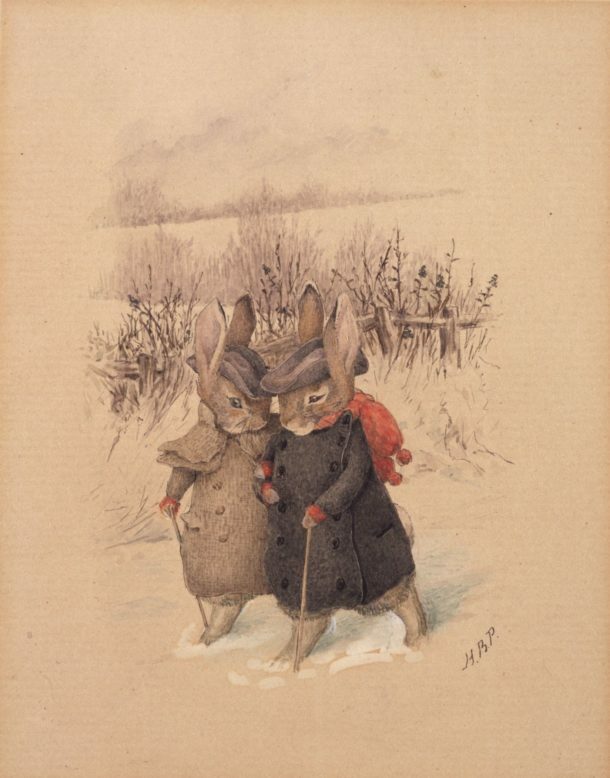 Did you know that Beatrix Potter’s first published works were greetings cards? 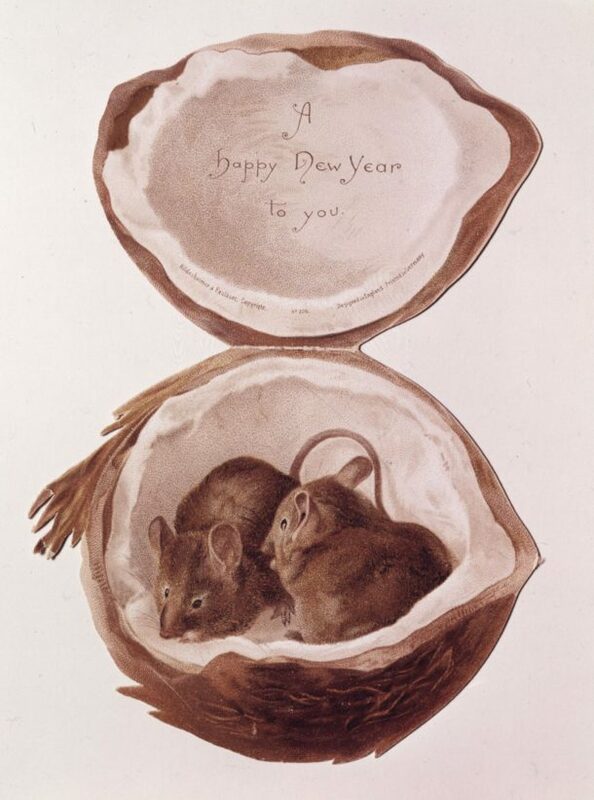 New Year card published by Hildesheimer & Faulkner, 1890. © Frederick Warne & Co. 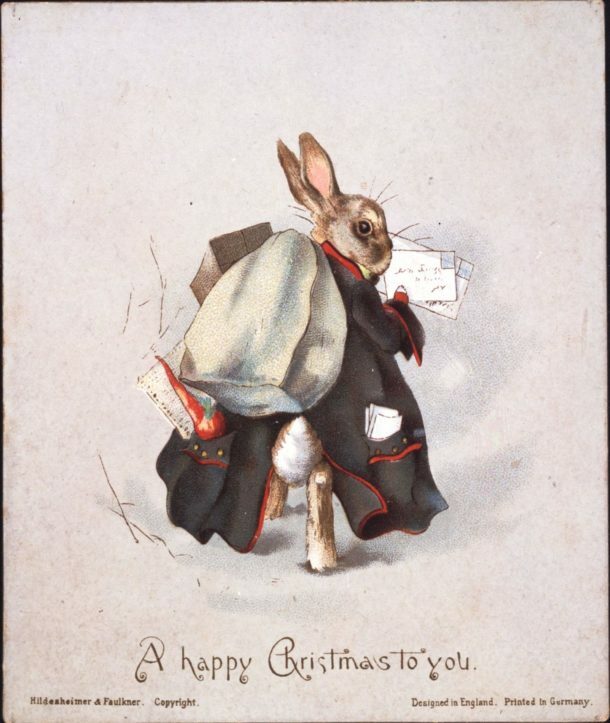 In accordance with her parents’ Unitarian beliefs, Christmas was acknowledged rather than celebrated in the Kensington household Beatrix Potter grew up in. Despite this, she enjoyed making Christmas and New Year cards for her relatives as a young woman. She said of those she made for Christmas 1889: ‘the cards were put under the plates at breakfast and proved a five minutes wonder.’ Her uncle later commented that ‘any publisher would snap at them’. Encouraged, Potter began preparing finished drawings to send out to commercial publishers. At 23, she hoped to see her work in print for the first time. Greetings card design, 1890. The Trustees of the Linder Collection. © Victoria and Albert Museum. With kind permission of Frederick Warne & Co.
Potter and her brother, Bertram, began sending out her designs. The second publishing company they approached, Hildesheimer & Faulkner, a leading purveyor of greetings cards in London, replied with enthusiasm, sending a cheque for £6 and a request to see additional designs. But their letter also revealed a certain misunderstanding on their part – they thought the card designer concerned was ‘a gentleman’. Greetings card design, watercolour and gouache on paper, about 1890. 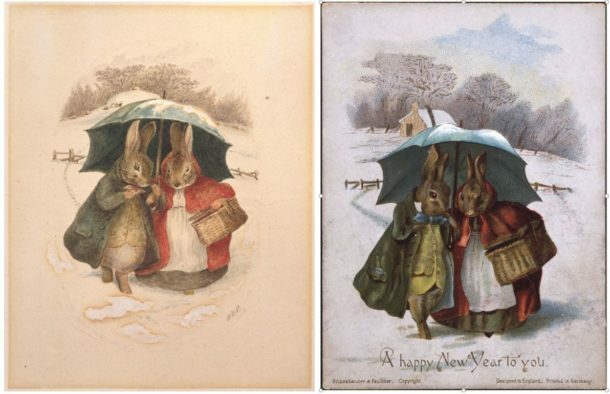 © Frederick Warne & Co.
Hildesheimer & Faulkner took several of Beatrix Potter’s designs for publication in 1890. Christmas card published by Hildesheimer & Faulkner, 1890. © Frederick Warne & Co. 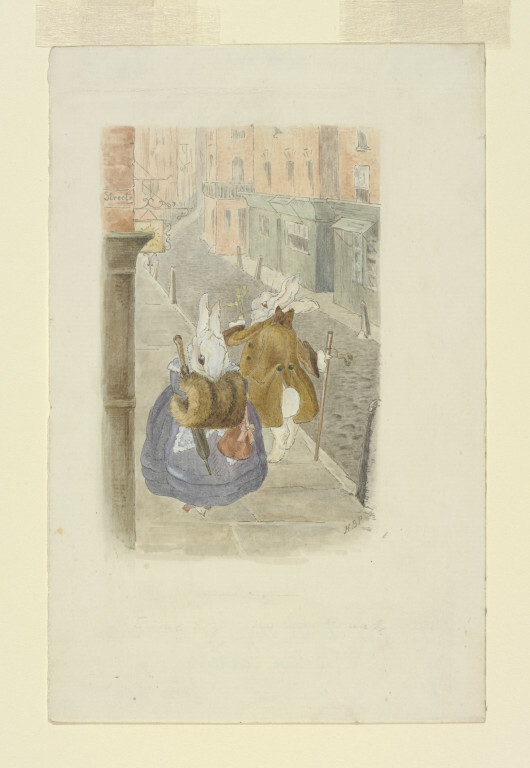 When preparing her designs in watercolour, Potter adapted her use of colour so that they could be better reproduced using the colour printing method chromolithography. Even so, the drawings lost much of their quality in reproduction. Perhaps this is why Potter later said that she ‘never liked those cards’. Her early experiences with chromolithography probably also contributed to the decision to use the three colour process, a new technology more adept at reproducing her subtle watercolour work, in the printing of her first book, The Tale of Peter Rabbit, over a decade later. Watercolour and pen and ink design shown alongside the finished greetings card published by Hildesheimer & Faulkner, 1890. © Frederick Warne & Co. In addition to publishing the greetings cards, Hildesheimer & Faulkner also repurposed Potter’s designs within a seasonal booklet. 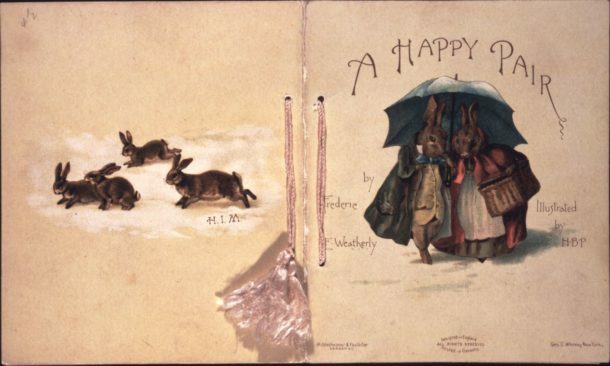 Although the accompanying text was written by another author, Frederic E. Weatherly, this little piece of seasonal ephemera was the first published book to be illustrated by Beatrix Potter. A Happy Pair, London: Hildeheimer & Faulkner, 1890. 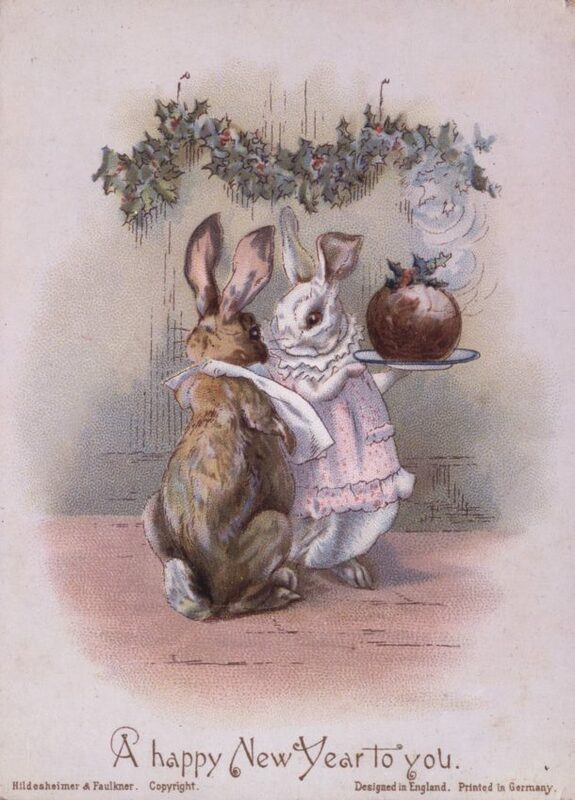 © Frederick Warne & Co.
New Year card published by Hildesheimer & Faulkner. © Frederick Warne & Co. Some examples of Beatrix Potter’s earliest card designs and a copy of the seasonal booklet A Happy Pair are included in the current display in gallery 102, Beatrix Potter’s London. Other examples can be viewed by appointment at Blythe House. You might also enjoy this display of other Victorian Christmas cards in Gallery 108 of the V&A.